OneStepCheckout is a checkout extension for the Magento ecommerce platform that has taken the community with storm. We launched the first version in fall 2009, and currently have over 5000 installations of OneStepCheckout in all possible Magento versions, everything from old Magento Community versions to brand fresh Magento Professional and Magento Enterprise 1.11 installs. 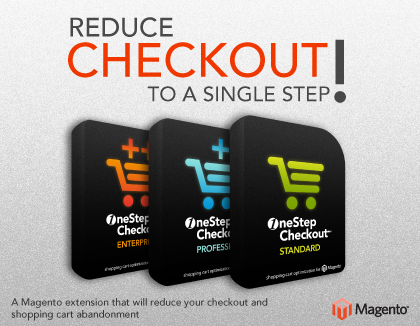 OneStepCheckout has become the checkout module in the Magento ecosystem. In the latest version we have gone through a major refactoring of all the code to improve compability with third party modules like shipping and payment modules, and also a lot more. We are proud to announce the most compatible checkout module for Magento! OneStepCheckout simplifies the checkout process of your Magento store. Checking out is often the most complicated part of placing an order online, and many users end up abandoning their order. Some customers will be motivated enough to purchase regardless of how difficult it is – but others will be lost due to checkout complexity. OneStepCheckout greatly simplifies this process, leading to an increase in sales. OneStepCheckout is all about reducing customer abandonment and increasing conversions. Our module comes packed with a ton of features. You reduce checkout steps from six to one, simplify the process completely, avoid confusing customer with questions about registration. Simply provide a better checkout experience. Our Magento module is very easy to install, and follows the module development guidelines set out by Magento. The software is delivered as a ZIP file (you can download it from our download area) and it can be uploaded directly to your Magento installation. Also, the source code is not encrypted in any way, so you are free to make changes as you desire. OneStepCheckout is developed like any regular Magento extension and follows the Magento module guidelines. It does not override any core classes or templates, which makes it unlikely to come into conflict with other modules. Installation is as easy as uploading the contents of the ZIP file to your Magento installation, and the rest will be done from the administration interface. Also, the module will not overwrite any files, just add new ones. OneStepCheckout is thoroughly tested on all Magento editions and versions. Our module is also tested in all modern browsers. The source code is not encrypted in any way, so it is fully possible to make customizations as you desire.